Vodafone’s Sure Signal 3G booster product is now available in NZ. Sure Signal is aimed squarely at mobile users who have problems getting decent mobile signal at their homes or offices. There are locations all over NZ, even in major coverage areas where mobile reception can be patchy – places in the shadow of a hill or building for example or basements and even areas limited by not having a cell tower close by thanks to resource management or local zoning issues. A friend of mine gets great coverage everywhere in her home except her bedroom, how critical this is for her I don’t know but it sure would bug me. 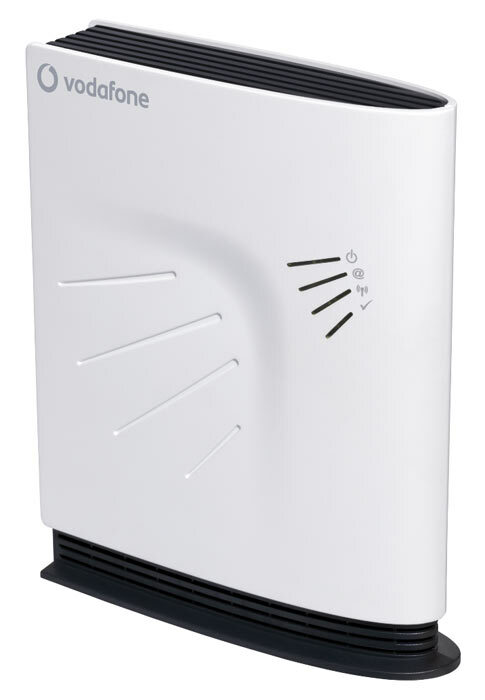 Sure Signal is a router sized box that plugs into a fixed line Internet connection (only fixed line users with a Vodafone Internet connection capable of speeds of at least 1Mb per second need apply). It then allows 3G mobiles to get strong and reliable 3G coverage without having to access the conventional mobile network. No configuration is required, this really is a plug and play (or plug and call) solution. It was demonstrated at a launch event this week at Bethells Beach on Auckland’s West coast. The Bethells Beach Cottages are a luxury getaway spot with absolutely zero mobile reception, which has been both a blessing and a curse for owners Trude and John Bethell. Some guests love being out of the coverage zone, others simply can’t handle it and walk around the area or stand on tables desperately trying to get a bar of signal. Some even drive towards Auckland to get connected. In this mobile dead zone, Sure Signal gave me instant 3G coverage, which was fast and stable, so it certainly works as advertised. The unit allows up to four mobiles to connect simultaneously at distances of up to 20 meters from the unit. The normal RRP is $349 but there’s a special introductory deal available until the 15th of March where the units are only $99. If you’re out in the boondocks or just in a bad place mobile-wise, this seems to be a good solution, especially at that introductory price. Ideally this product would be built into a unit that combines the Vodafone modem, a Wi-Fi router and the signal booster but that may be some way down the track. An Enterprise version is also available for business users. This model connects up to eight mobiles at distances of up to 40 meters but it costs $899. Bear in mind that you need to be a Vodafone 3G mobile user and have a Vodafone broadband connection. Non 3G phones won’t work and nor will 2 Degrees mobiles. Broadband data used by the Sure Signal service is zero rated, so it doesn’t count against your fixed line Internet allowance but it still gets knocked off your mobile data allowance.